Heat oil in medium sauce pan over medium-high heat. Add shallot, garlic, and thyme. Cook until aromatic, 2 to 3 minutes. Add berries. Cook 2 to 3 minutes. Add Tassel Ridge Finalé Blackberry . Bring to a hard simmer, but do not boil. Reduce heat to medium-low. Simmer about 1 hour or until liquid is reduced by ½ to ⅔. Strain mixture, making sure to press berries. Bring back to a simmer over medium heat. Add demi-glace. Simmer about 5 minutes. Add reserved berries. Serve over your favorite steak. Makes about 1½ cups. Serving Suggestion—Blueberries work best with a New York Strip, the fat in the meat complements the acidity and sweetness of the fruit. 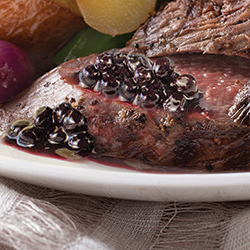 Blackberries work best with a Filet Mignon, the blackberries complement the rich meatiness without being overpowered by the meat’s flavor and fat. Wine Recommendation—Tassel Ridge Finalé Blackberry. Finalé Blackberry has flavors reminiscent of blackberry jam with a warming finish. Yummy!